Before describing the imposing and famous funerary complex at Gizeh we might look at what that famous Greek «journalist», Herodotus, had to say about it on the basis of the testimony of various foreigners who had lived in Egypt. Although Herodotus often criticized Egypt and its inhabitants he nevertheless left us an incredible amount of precious information. He writes «Cheops left behind him a colossal piece of work, his pyramid. Up to the reign of Rhampsinitus, Egypt was excellently governed and very prosperous. Cheops, his successor, compelled his subjects to labour as slaves for him. Some were forced to drag blocks of stone from the quarries in the Arabian hills to the Nile, where they were ferried across and taken over by others who hauled them to the Libyan hills. The work went on in three- monthly shifts, a hundred thousand men in a shift. Afeter this introduction Herodotus recounts the story of the building of the Great Pyramid, giving us the most precise details, from the typically Egyptian stylistic characteristics to the costs involved for the work on this strange edifice. «The pyramid was constructed in tiers or steps, something like battlements, and when the base was completed the remaining blocks were lifted by a kind of crane made of short timbers onto the first tier. On this first tier there was another lifting-crane which raised the blocks a stage higher, then yet another which raised them higher still. Each tier had its own crane or it may be that they used the same one which, being easy to carry, they shifted up from stage to stage as soon as its load was dropped into place. I describe the two procedures given in the two versions which I have heard about. The finishing off of the pyramid started at the top and worked downwards, ending with the parts nearest the ground. 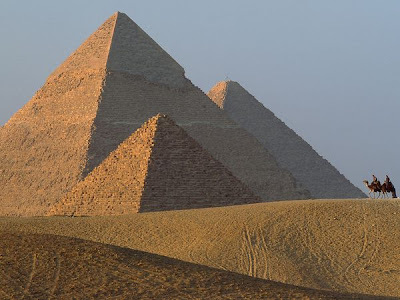 An inscription on the pyramid in Egyptian characters records the amounts spent on horse-radish, onion and heads of garlic, and if I remember correctly what the interpreter who read me the inscription said, the sum involved was 1600 talents of silver (41,884 kilogrammes). If this is true how much must have been spent on the iron used, on other foodstuffs and on the clothing of the labourers? Not to mention the time it took, which cannot have been negligible, to quarry and haul the stone and to build the underground burial chamber». Four centuries after Herodotus the historian Diodorus of Sicily (1st entury B.C.) 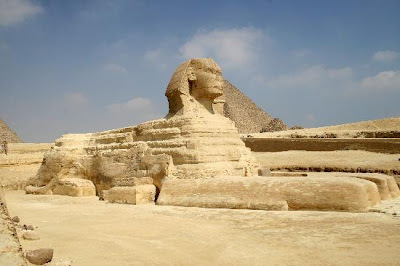 visited Egypt and in his turn visited the pyramids which he considered to be among the seven wonders of the world. Like his predecessor, Diodorus was filled with amazement in front of this monument. «One must agree» he wrote, «that these monuments are superior to everything else one sees in Egypt not only because of their enormous size and the prodigious sums which were spent on them but because of the beauty of their construction». Diodorus then gives us his version of how the pyramids were built. 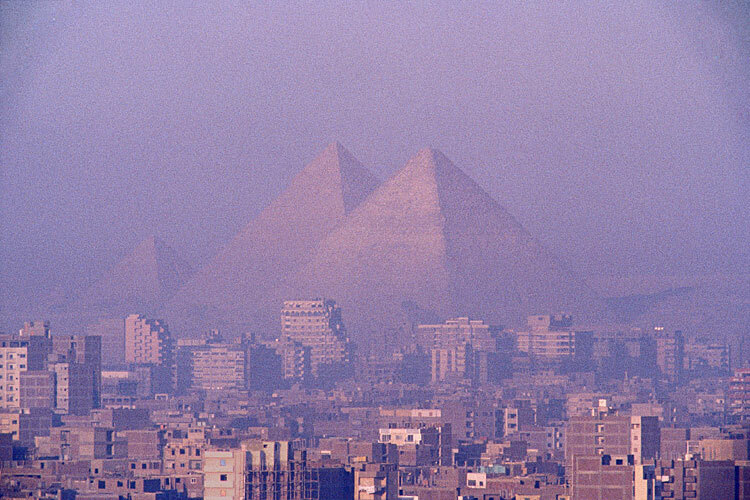 His account speaks of all three great pyramids which he presents as being a funerary ensemble of the IVth dynasty. The Great Pyramid is only one element of this ensemble, albeit the most prestigious element, and it cannot be studied or understood out of this context. Like Herodotus, Diodorus of Sicily evaluates the sum spent on horse-radish, onions and garlic for the labourers on the Great Pyramid at 1600 talents, but unlike Herodotus he believed that these monuments did not contain the bodies of the pharaohs which, in his version, had been buried in safe and secret hiding places. We shall not cite further Diodorus’s text which agrees, more or less, with that of Herodotus. We have only cited him at all in order to show that the greatest writers of antiquity were all equally impressed by the beauty and uniqueness of the Egyptian funerary monuments. At Gizeh the visitor is presented with one of the most beautiful sights created by the hand of man. 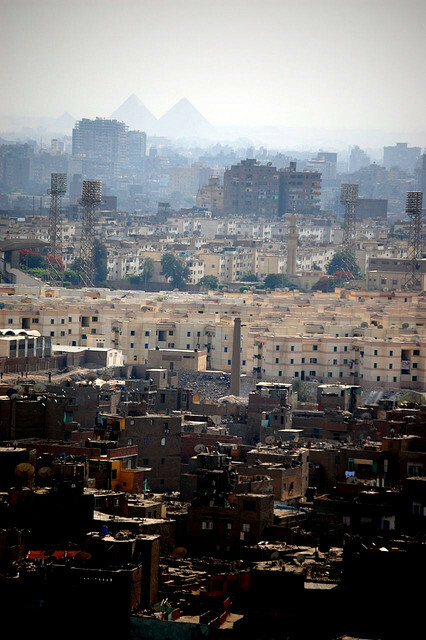 It is here that the Egyptian saying «Everybody fears Time but Time fears the pyramids» is most apposite. 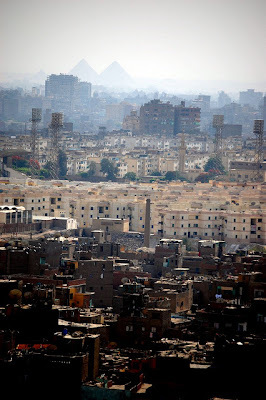 Gizeh is the present name given to the great necropoli of Cairo and it consists of a plateau having an area of about two thousand square metres. The Sphinx together with the three Great Pyramids, those of Cheops, Chep- hren and Micerinus are found here. The latter has three small satellite pyramids. The three monuments are arranged diagonally but in such a way that none of them hides the sun from the other two. Typically each pyramid consists of a funerary temple in the valley. The complex of Cheops is almost completely destroyed while that of Chephren is largely extant. 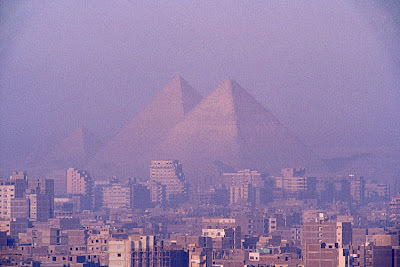 The pyramid of Cheops is the largest of the three. It was originally 146 metres high, today it is only 137 metres high, its truncated summit being a platform 10 metres square. Today the pyramid has completely lost its external facing, thus revealing the enormous internal blocks of stone over which one must laboriously climb in order to reach the summit. However the stupendous view from the top makes the effort involved well worth while. Chep- hren’s pyramid is the only one which still has, at least at the top the smooth external facing. Although it was lower than Cheop’s today it is in fact the same height because it is not truncated. It originally had a red granite facing at the base. Finally there is the smallest of the three, that of Micerinus, barely 66 metres high but of fairly regular dimensions. In the 16th century it still had its granite facing which today has completely disappeared. The burial chamber once contained a splendid sarcophagus of basalt, decorated in a manner common during the period of the Old Kingdom and called «palace faced». Unfortunately it was lost off the coast of Portugal when the ship carrying it to England was wrecked. In front of Micerinus's pyramid there are three satellite pyramids, even smaller than those of Cheops. The one to the east, originally covered in red granite, was probably intended for the wife of the pharaoh Kharmer-Nehty II. The poor state of preservation of Micerinus’s funerary complex is due to the fact that some parts of it were finished in rather more haste than anticipated using unfinished brick and as a result it rapidly decayed.